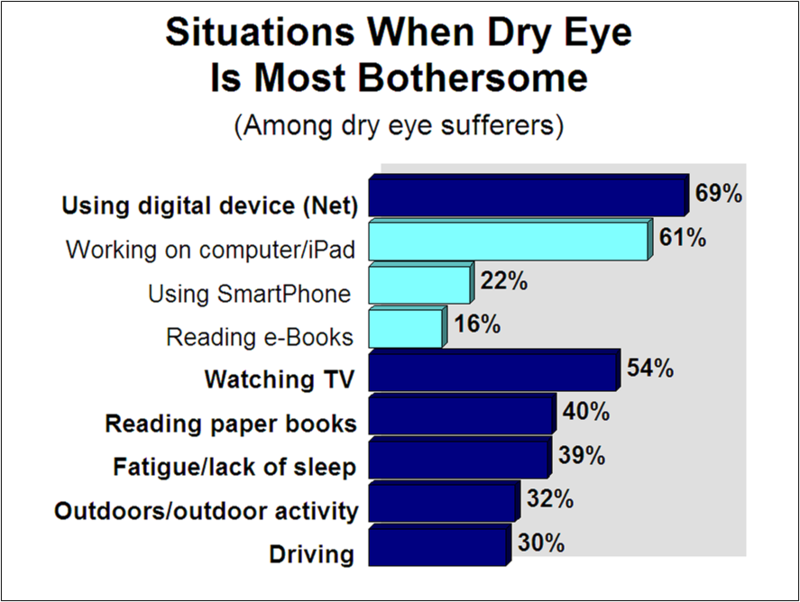 Dry eye sufferers say their symptoms are most bothersome while using digital devices (computer, tablet, SmartPhone, etc.). 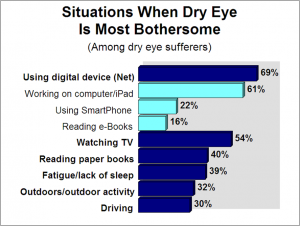 A growing share of dry eye sufferers are under a doctor’s care, although OTC eye drops/artificial tears remain the leading treatments. Daily use of OTC lubricant eye drops or artificial tears has climbed over the past year. This study was most recently conducted in two phases in order to track 1) incidence of dry eye among a general population sample of adults (n=1,000) and 2) delve deeper into dry eye treatment practices among a national sample of dry eye sufferers (n=776). Click here for more information. Diabetics all share the same disease threat, but they can react in very different ways. Some are capable of making serious lifestyle changes, while others struggle with change. 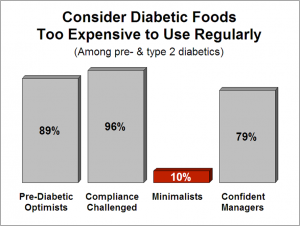 Many are receptive to food or supplement products formulated for diabetics, but others are discouraged by their costs or not convinced they are necessary. 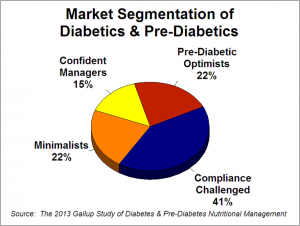 The Gallup Study of Diabetes & Pre-Diabetes Nutritional Management, most recently conducted by Multi-Sponsor Surveys in 2013, included an attitudinal segmentation analysis that identified four types of diabetics and pre-diabetics. 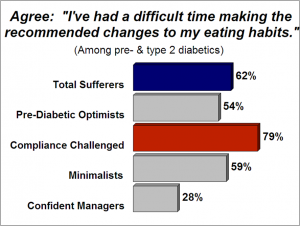 These segments range from Confident Managers who are doing all the right things to Pre-Diabetic Optimists who are not yet convinced they need to actively manage their condition. 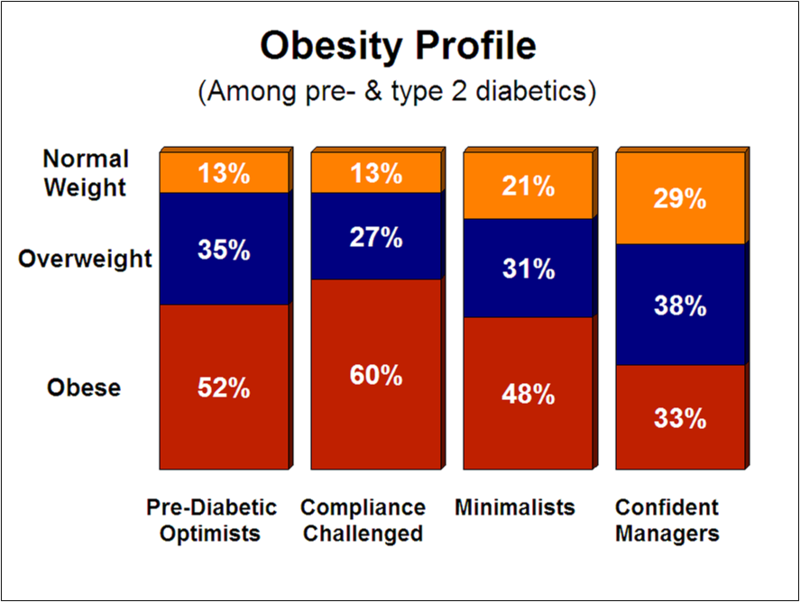 The 2013 survey was conducted among a national sample of 400 adult pre-diabetics and 615 type 2 diabetics in December 2013 and January 2014. • The largest group and the one having the hardest time coping. • Tend to be sicker than others, reporting higher levels of obesity, hypertension, numbness/tingling, arthritis, etc. • Less successful at maintaining healthy glucose levels despite frequent testing. • Visit their doctor regularly and more likely than others to have seen a diabetes educator. • Readily admit they have far more trouble than others following the dietary and lifestyle advice they have been given. • Most likely to complain about the high cost of specialty diabetic foods and beverages. • Lower incomes and education levels than any other segment. • These “model” diabetics know what to do and are the group most conscientious about following their doctor’s advice, eating right, exercising and maintaining a healthy weight. • They are the smallest segment (15%) which demonstrates the small share of diabetics who manage to fight diabetes on all fronts. • They have the lowest rate of obesity and exercise more than others. 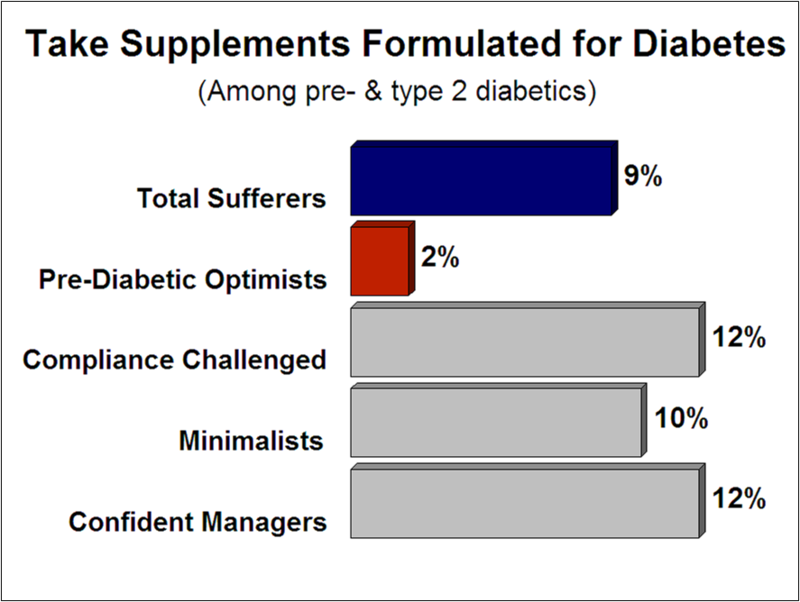 • Include both pre-diabetics and type 2 diabetics in roughly equal numbers. • They are the best educated and most affluent group. • Far less likely to complain about price of diabetic foods and beverages. 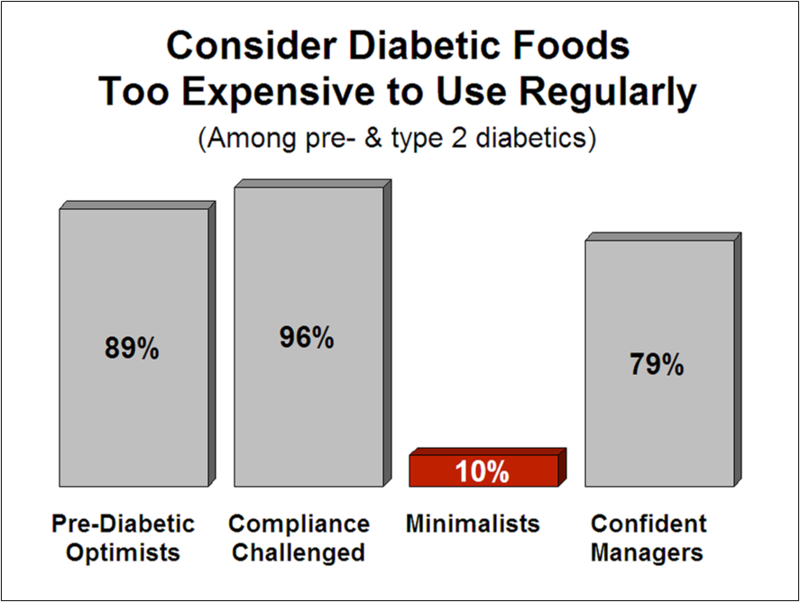 • They are a knowledgeable group, like Confident Managers, yet Minimalists are not trying as hard to comply with all the recommended protocols and this is reflected in their lower level of success managing their blood glucose levels. • This group is an attractive market for diabetic products given their knowledge and incomes, but they need more encouragement and motivation to move forward. 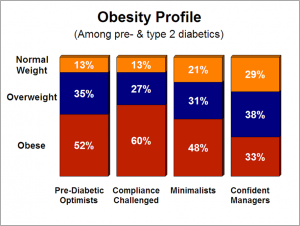 • The most recently diagnosed group is also predominantly pre-diabetic. • Their diabetes is fairly easy to control at this point and they worry less than others about the long-term health impact. • As such, they make less effort to monitor their diet or consume diabetic foods or supplements. • Most visit their doctor regularly for blood level tests, but don’t yet test on their own at home. 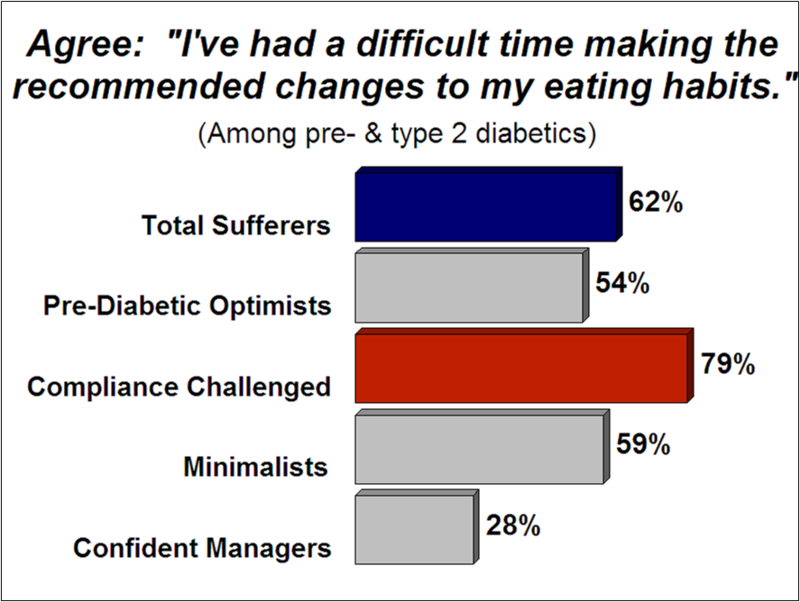 • Less likely than others to have consulted diabetes educators or nutritionists. For more information, or to subscribe to the 2015 Gallup Study of Diabetes and Pre-Diabetes Nutritional Management, please contact Linda DeStefano, Vice President at Multi-sponsor Surveys, Inc., Linda.Destefano@multisponsor.com. Pre-field subscription qualifies subscribers for discounted pricing and opportunity for questionnaire review and input prior to fieldwork. 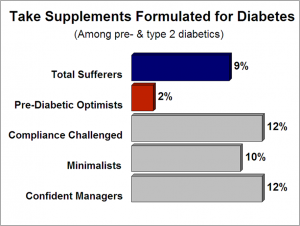 Multi-sponsor Surveys offers a series of trended, primary market research reports covering the Diabetic market, including . 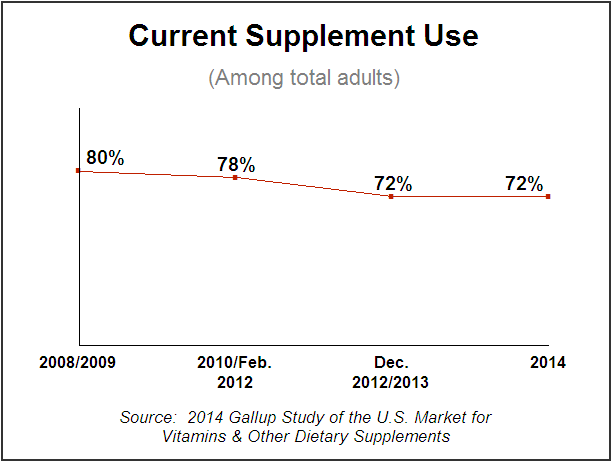 . .
Use of dietary supplements has dropped off somewhat over the past two years after decades of growth tracked by Multi-sponsor Surveys’ annual Gallup Study of the U.S. Market for Vitamins and Dietary Supplements. 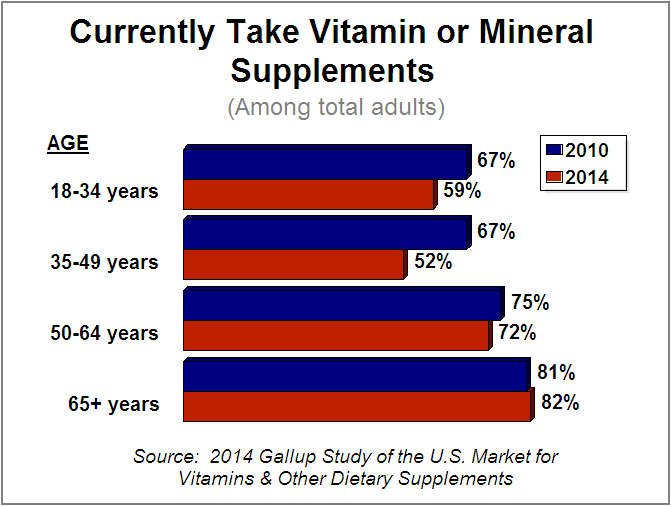 This shift away from supplements is most pronounced among Millennials and Gen X adults who typically don’t share their elders’ conviction that supplements are necessary to ensure good nutrition. Growing interest in obtaining nutrition via foods, particularly fresh, unprocessed foods, appears to be a key factor dampening interest in supplements. 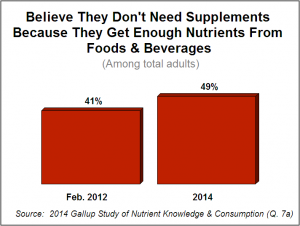 • Interviews conducted in October/November 2014 among a national sample of 1,020 adults find nearly half (49%) of adults now believe they, “don’t need supplements because they get enough nutrients from foods and beverages,” up from 41% just two years earlier. • After years of being told about ‘superfoods,’ and the benefits of whole grains, nuts, fresh fruits and vegetables, consumers are recognizing the variety of nutrients available in their own kitchens. 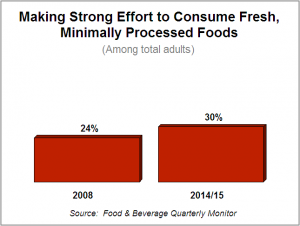 Efforts to consume fresh, unprocessed foods have climbed in recent years as consumers strive to eat ‘cleaner’ foods with recognizable ingredients and avoid chemical additives. • Moreover, the adults most strongly committed to fresh, unprocessed foods are typically very confident in the healthfulness of their diet and firmly committed to improving their nutrition via foods, not supplements. • Although many of those committed to fresh/ unprocessed foods are currently taking supplements, their first choice for nutrition appears to be natural food sources. 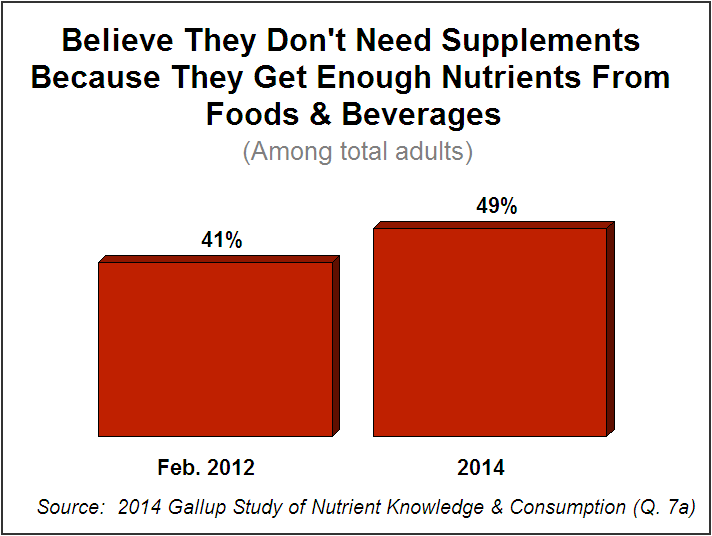 Millennials and Gen X are the key drivers behind these trends favoring nutrition via food vs. supplements. • The recent decrease in supplement use has occurred primarily among Millennials and Gen X adults, while supplement use has remained fairly stable among those age 50+. • A key contributor to young adults’ shift away from supplements is their above average confidence in their ability to satisfy their nutrient needs via diet alone. 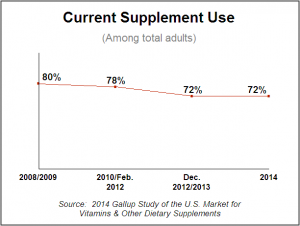 Many are simply not convinced that supplements are necessary. • Natural, organic and clean label foods have strong appeal to adults under the age of 50 and these younger adults are often more willing to pay the higher price of these premium products – – for themselves and their children. • Supplement manufacturers are already providing many of the product innovations that appeal to younger supplement users and should continue promoting these products to encourage young potential customers. These include clean label supplements, gummies and other alternative delivery forms, sports nutrition products and those formulated for relevant needs such as energy, mental alertness and skin health. This new quarterly omnibus service, launched in March 2014, provides affordable, fast answers to your marketing questions, plus the ability to analyze survey responses within the broader context of consumers’ food and beverage behaviors and mind-set. ▸ developing detailed profiles of brand/product users that go beyond basic demographics to capture attitudes, dietary approach, lifestyle, etc. ■ LARGE SAMPLE SIZES – 1,000 interviews per quarter, yielding 4,000 interviews by year end. ■ QUICK TURNAROUND – providing survey results within 3 weeks after interviewing completes. ■ PROFESSIONAL ADVICE – assistance with question development and wording is available upon request. ■ DIETARY-DECISION MARKET SEGMENTATION monitors 5 consumer groups ranging from Pure Green’s, who willingly find time to prepare tasty, healthful meals with fresh ingredients to the Convenience Driven, who opt for packaged convenience foods and typically don’t bother to include vegetables, unless they are french fries. Clients may purchase this segmentation separately and use it to examine proprietary survey findings among the 5 segments. Survey Results: Available one month after interviewing. – 1 banner (containing up to 19 banner points) defined by client using any of the 100+ analysis variables listed below. ▪ Discounts may apply for purchase of multiple questions and/or questions asked of smaller sub-samples. Contact Linda.Destefano@multisponsor.com for more pricing details. 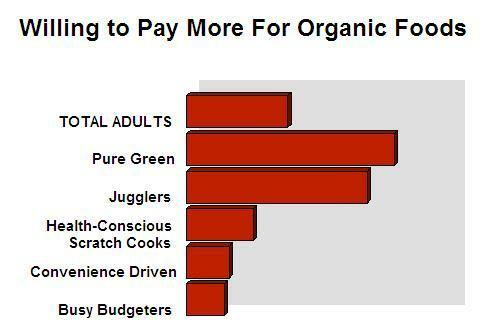 Dietary Decision Market Segmentation Report …….$950. Multi-sponsor Surveys identified 5 consumer segments, who each take a distinct approach to eating and meal preparation. They range from the Pure Green’s who make time to prepare healthful meals to the Convenience Driven, who opt for packaged convenience foods rather than learning how to cook. Clients may analyze results of their proprietary questions by these segments to gain insight into the mind-set of their customers or target audiences. 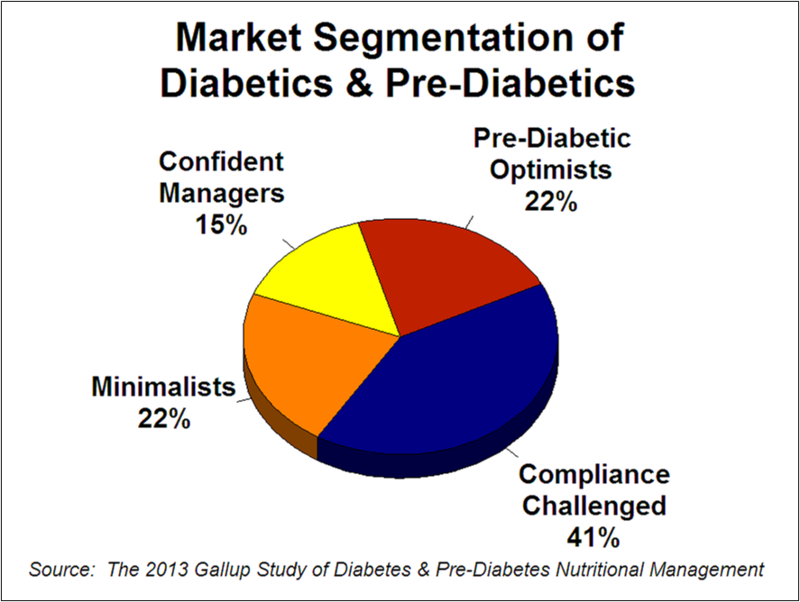 Use of the Dietary Decision Market Segmentation requires purchase of the $950 report profiling each of the segments. Pure Greens – – eco-friendly proponents of fresh, organic and ‘gourmet’ foods. Busy Budgeters – – challenged by busy lifestyles on a budget. Many have been forced back home for meals they used to enjoy eating out. Health Conscious Scratch Cooks – – the oldest segment and often face health issues motivating healthier eating habits. Convenience Driven – – skew male, are uncomfortable in the kitchen and heaviest users of convenience foods. ▸ Daily eating pattern – – 3 meals a day, 2 meals, etc. ▸ Types of dinner prepared at home – – made from scratch, from packaged foods requiring preparation, head-and-serve foods, take-out food, etc. ▸ Kitchen appliances used regularly – – slow cooker, blender, juicer, vacuum sealer appliance, etc. ▸ Ownership of digital technology – – laptop, tablet, SmartPhone, etc. ▸ Satisfaction with various components of wellness, such as weight, physical fitness, energy level, appearance, health, etc. Quick, easy to prepare foods work best for me and my family. 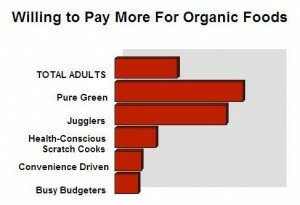 I am willing to pay more for organic foods. I make a strong effort to consume fresh foods instead of processed foods whenever possible. I rarely plan meals ahead of time. I monitor what I eat so I won’t put on weight. I seek out eco-friendly products even if they cost a little more. I avoid foods/beverages containing chemical additives and artificial ingredients. I have a very busy lifestyle. I lead a much healthier lifestyle than most other people my age. Rising food prices are forcing me to economize at the grocery store. As a syndicated research offering, all findings are solely for the confidential use of subscribers in making internal marketing and management decisions.